I have been drawn to poetry more than ever this year. A sign of the times. Poetry offers an antidote, a distillation of imagery and emotion, in a world that assaults our senses through the 24-hour news cycle and social media. But, it is also a reflection of my own evolution as a reader and a writer. I want to immerse myself in language, structure, and form. Poetry opens knots in my prose. But writing about poetry tends to intimidate the non-poet, or the person who has not been trained to read it. But I write about prose without any special training. My intention is typically to attempt to write through the experience of reading a work, a process that, in itself, feeds a deeper reading. So why can’t I apply the same logic to writing about poetry? No reason at all. 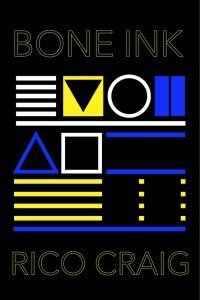 Stumbling onto this post this morning and reading Roughghosts review I realized – I have to get a copy of Bone Ink! Hopefully it isn’t a problem to get one over to Canada! I’ll soon find out. I really love your writing Rico. When I get to the check out it doesn’t let me fill anything in. Heads are there for Contact, Shipping and Payment – but no fields to fill in. If you pop through your email I’ll send it on to the publisher and see if they have a way to help you out. Perfect! I’ll let you know how I make out. Bone Ink is on its way to Nova Scotia. I emailed re: the problem and Mark at Guillotine straightened it out. Looking very forward to having your book in my hands! That’s fantastic news! Thanks for making the effort to hunt it down. Hmmm. It doesn’t look like I can order it directly through Gillotine Press. Do you have an idea for the best route? Thanks. That’s odd. There’s worldwide shipping. And it has Canada as an available option at this end. I’m heading out for a couple of days (being called as I write this) but when I get back I’ll figure it out. It could be my browser but I doubt it as I’m using Chrome. I’ll figure it out though.